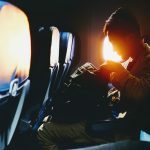 With only weeks left in Australia, we found ourselves with the terrible first world problem of some free flights but no real reason to use them. Two of the credit cards we have for the frequent flyer points include a free return flight to certain points within Australia. Each card had different options, and the only ones that overlapped were Melbourne and Canberra. Melbourne we’ve been to a few times a year lately, and while I am happy to go back, Simon had never been to Canberra, so we booked to go there instead! As this trip is only two weeks before we leave Australia for twelve months, our budget is particularly limited. We are therefore doing this trip cheaply, with only a few small splurges. 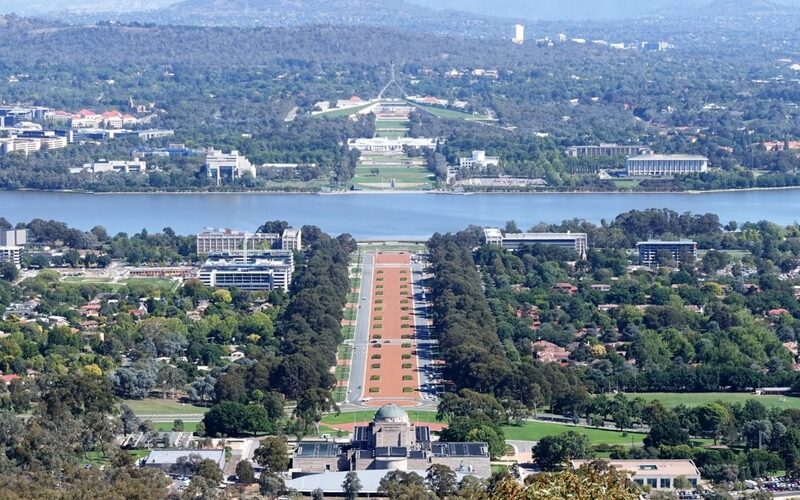 Luckily, of all the Australian cities, Canberra seems to be a place with plenty to do that is free or cheap. I found cheap accommodation a challenge. 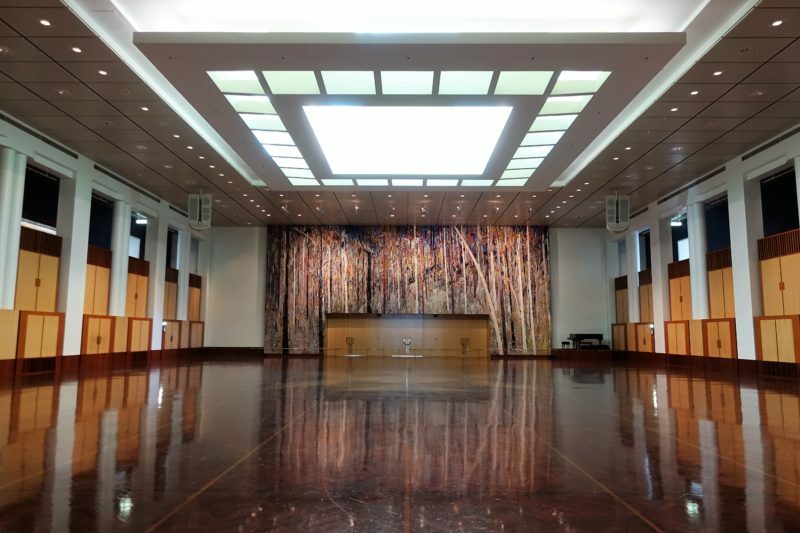 Canberra is a parliamentary city, and it also has some big universities, so it caters well to political and academic visitors. It is not so much a budget tourist city. Canberra City YHA looks good, but we are past the days of dorms, and unfortunately their private rooms were booked. 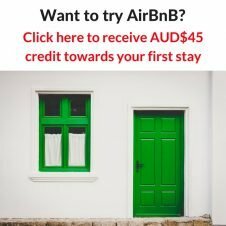 Dorms start at $41AUD/person per night. The private rooms start at $124.50AUD with shared bathroom, or $139.50AUD with ensuite. These prices come down a little with membership. My next option was AirBnB. 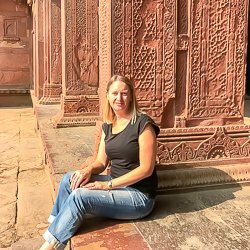 I found a place for $95AUD/night, but was rejected because a booking of four nights was not long enough (even though it was listed as one night minimum). In the end I settled on University House. We got a spacious living area, with a separate bedroom with ensuite. 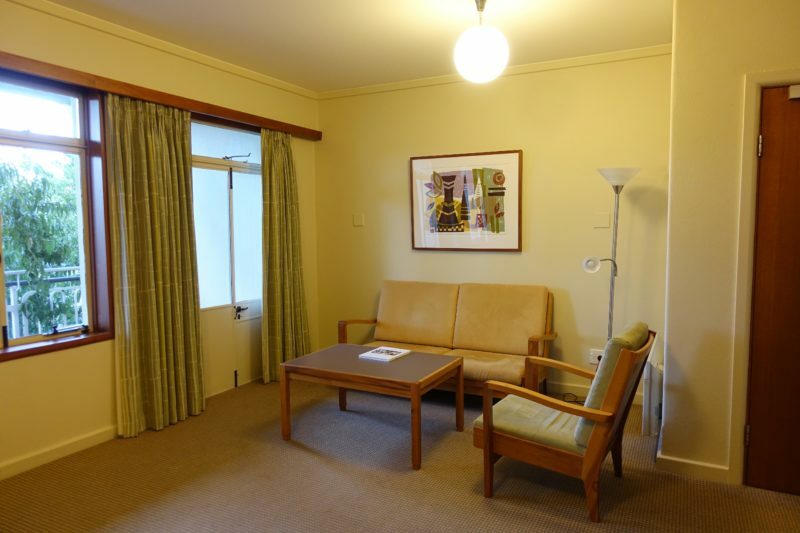 The rooms are clean and well maintained, although the style of furniture is a little dated. Tea and coffee facilities were included, as was free wifi. University House is on the campus of Australian National University, so it has many nearby facilities, including a cafe, restaurant, and mini-market. There is also free car parking available if required. Overall value for money was fantastic! My only complaint was the wifi. I found it to be slow the majority of the times I was using it. 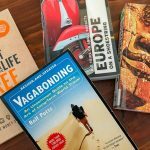 If you are just holidaying then it’s probably not an issue, but if you plan to work, then it’s a little more challenging. The living area of our room at University House. I have to admit, when Simon suggested Canberra, I was worried there would not be a lot to do to fill our time. Boy was I wrong! And even better, mostly it was free! Here are the things we did, and also some of the things we did not get to do, but will put on our list for next time. I am not an “art” person! I know a couple of the well known artists, but after that, I’m pretty ignorant. 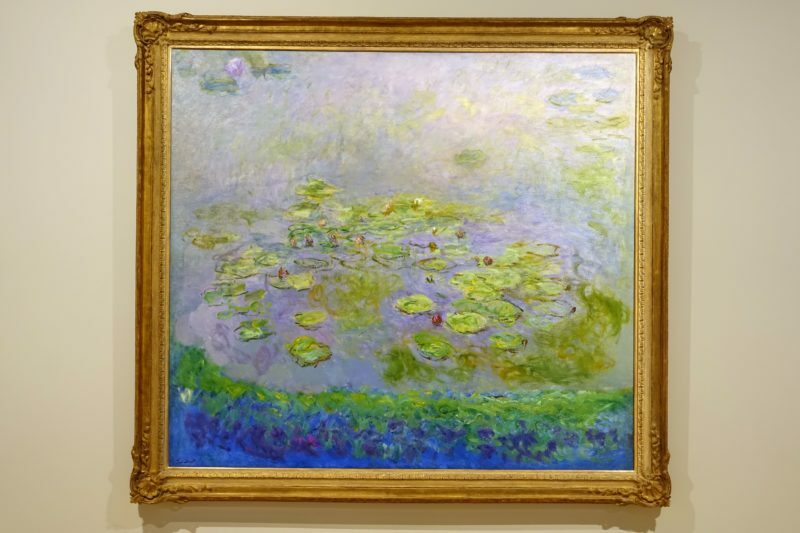 A visit to the art gallery for me, is a quick walk around, admiring what catches my eye, then moving on. 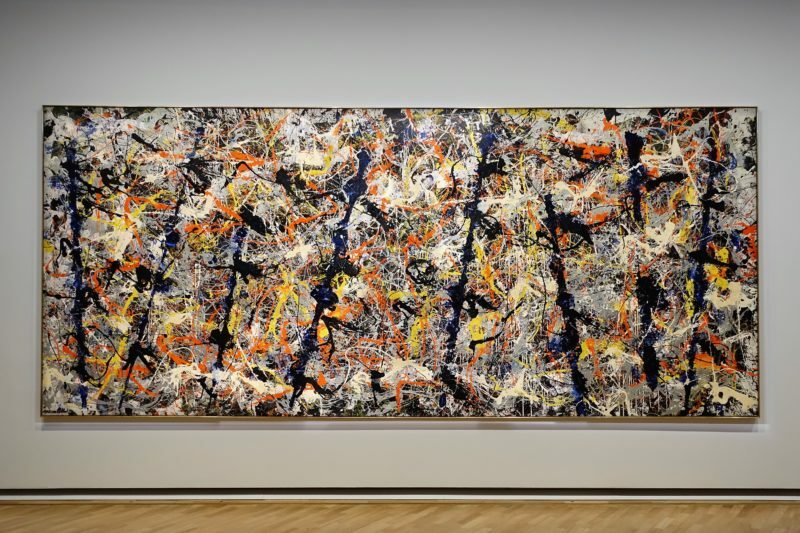 So when we visited the National Gallery of Australia, it was with a little pride that could say “Oh, I’ve heard of that artist/painting!” There is a Monet or two, a whole section of Sidney Nolan’s Ned Kelly paintings, and Blue Poles by Jackson Pollock. There were probably lots of other famous artists there too! We spent a good hour, possibly two, wandering through the vast halls. There was no charge for general entry, but they do charge for special exhibitions. At the time of our visit it was “Versailles: Treasures from the Palace”, but with entry at $27AUD per person, we gave it a miss. 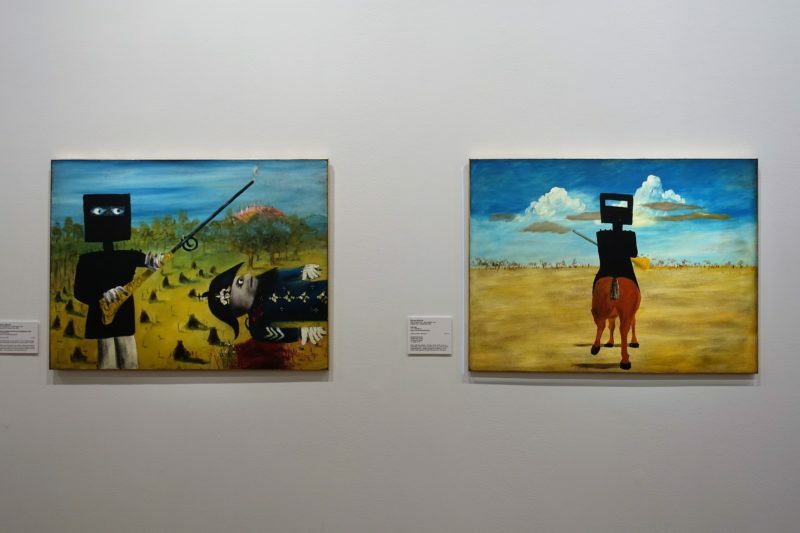 Ned Kelly paintings by Sidney Nolan fill a whole room. Just next door is the National Portrait Gallery of Australia. We had seen enough art for one day, so we gave this a miss, but if you are interested in visiting, entry is free. Okay, a library is a library, they have books, people go there to read and study, and, well, that’s about it! If you are a book person like I am though, I just have to go inside to have a quick look around. Especially when the library building is so obvious and is seen from every direction. The National Library of Australia is of course huge! After looking around for a few minutes our eye was caught by a display they had called “The Sell”. 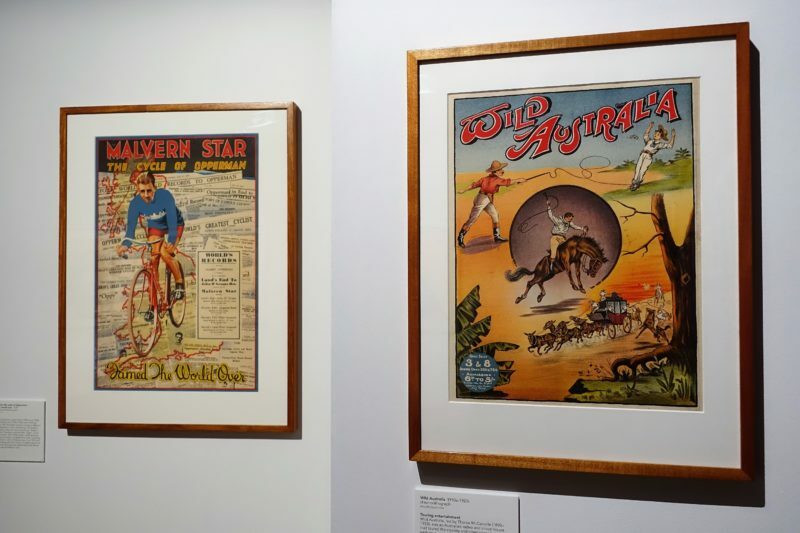 It was about advertising in Australia over the last 200 or so years, and it was great fun looking at the old posters for products that are no longer around. Did you know the advertising for Minties, “It’s moments like these…” has been in use since 1926? (Minties are an Australian lolly. Do people know these internationally?) This visit was free. This is another building you just can’t help but notice in Canberra. There is a sculptural loop high above it. I never did find out the significance of the loop though as we wandered through displays on Australian history and some other more modern items. 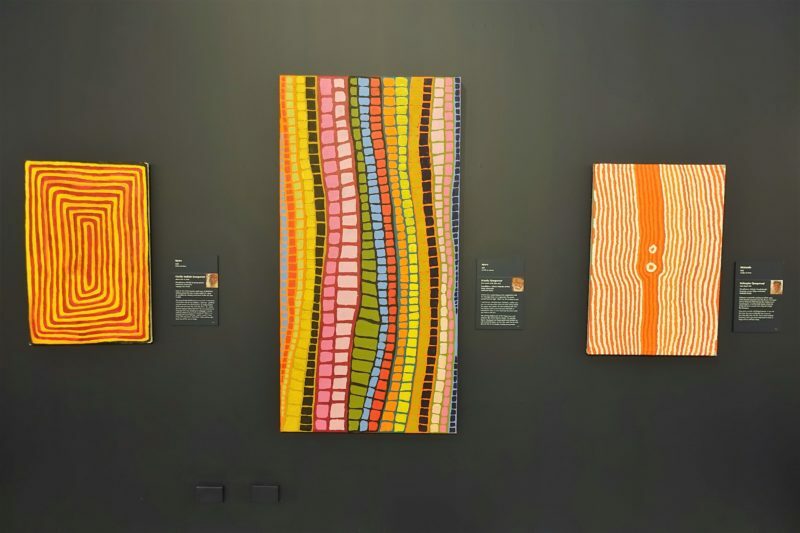 There is a good portion of Aboriginal and Torres Strait Islander history here, as well as history regarding the European settlement. Entry to the main portion of the museum is free, and there is enough here to spend an hour or two looking around. Currently the museum is also running virtual reality screenings of David Attenborough documentaries. We did not get a chance to watch one, but it looks pretty spectacular. Entry is $20AUD per person. There are many different areas full of displays. These poles had continuously changing Australian scenery on them. I spent way too long watching all the different variations. 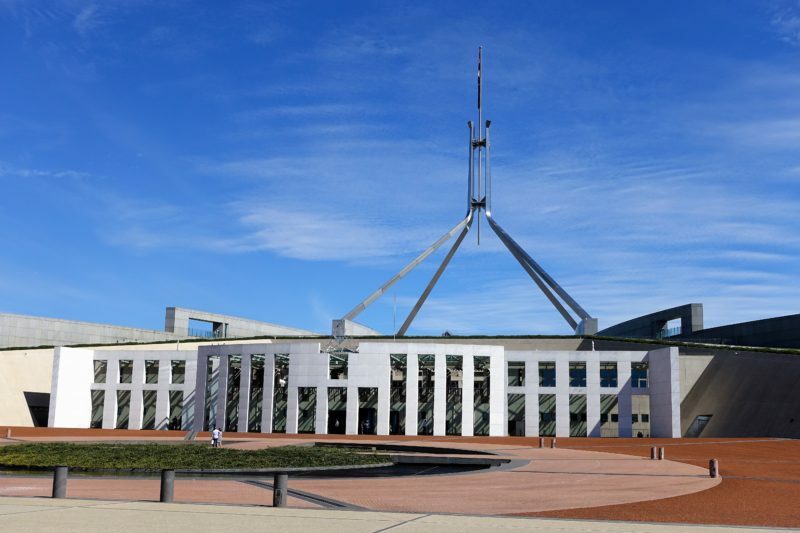 Parliament House is a relatively new building, opening in 1988. It is huge, with over 4700 rooms. When the public visits though, there is only the option to look at a tiny number of these rooms. As we arrived, hot and sweaty from the long walk up the hill, one of the free tours was starting, so we quickly tagged on to the end, missing only a few minutes. We first visited the Great Hall, basically a large reception room which can seat up to 1000 people and is used on formal occasions. We moved on to the House of Representatives and the Senate chambers, stopping in the hallways for comments on some of the paintings and other details. The Senate. Rather than the traditional red we have borrowed from the British, the colour is based on the blossoms from the local eucalyptus trees. Our guide was very knowledgeable and had some great stories of past politicians and the goings on around the place. In general I found Parliament House itself a bit boring though. The building is very eighties in style, and quite sparse due to it’s size. It felt a little characterless, but perhaps that was because we visited on a Sunday, so nothing was happening. I would like to visit again one day when parliament is sitting to see if there is a different atmosphere with a lot more people around. It is also possible to pay for behind the scenes tours when available. 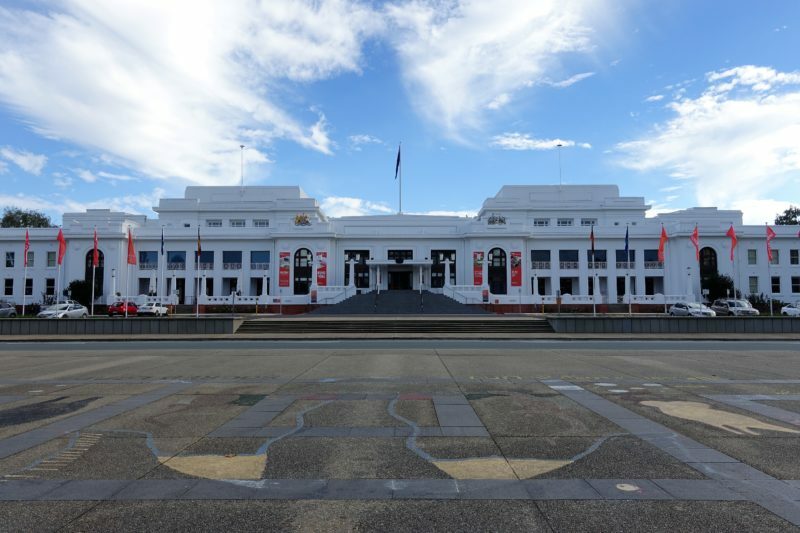 Old Parliament House, now housing the Museum of Australian Democracy, was built in 1927 as a temporary measure while the permanent building was constructed. It took 61 years for that to happen. Over the years it was expanded a few times and by the time the new building was under construction it was bursting at the seams. While some of the building is now in use for commercial purposes, all of the main areas are available to look through. 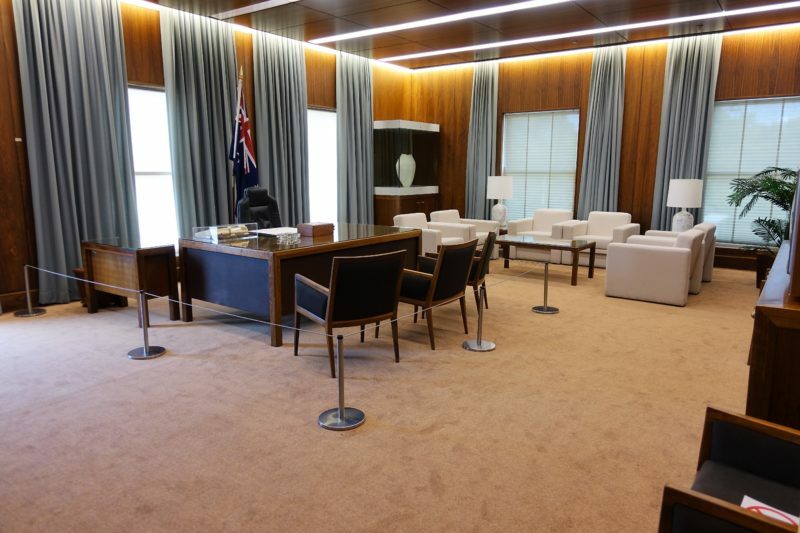 The Prime Minister’s office is as it was left by Bob Hawke on his move to his new office. It was crazy to see that the office of the Treasurer was half the size of my office when I was working. Other senior politicians actually shared offices! The press area was absolutely tiny too. This building, apart from the size, was more what I was expecting in terms of a parliamentary building. It had that feeling of history and occasion. 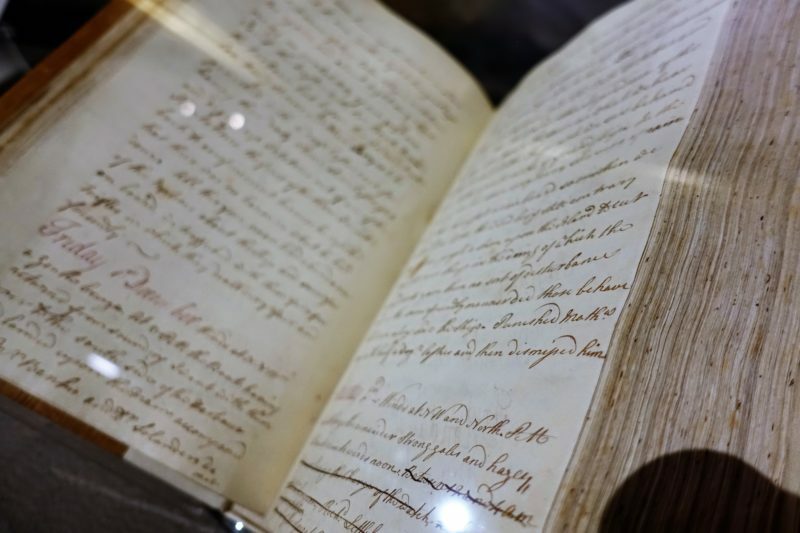 There is some good information about the past Prime Ministers and government procedures. As it was our last visit for the day, we ran out of time to see everything in detail, so I would suggest at least a couple of hours to look around thoroughly. There are regular free orientation tours of about 15 minutes duration throughout the day. Entry is $2 for adults, $1 for children. 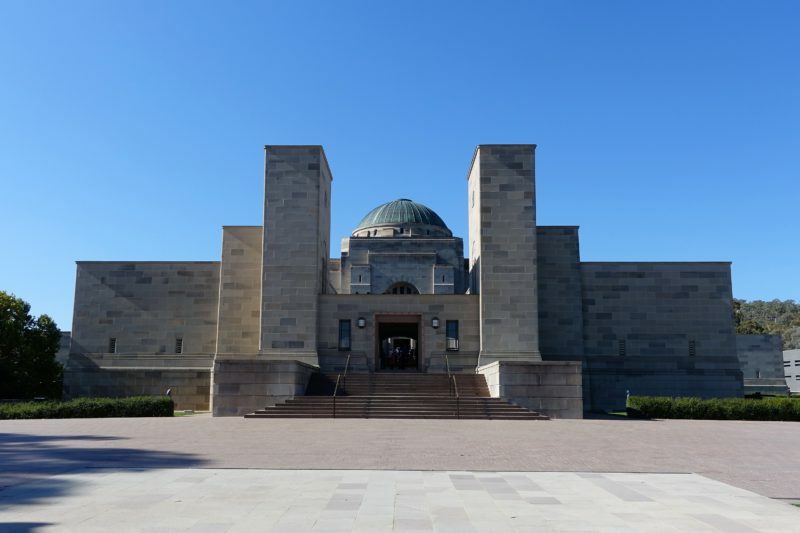 When I asked Simon why he wanted to go to Canberra his answer was to visit the Australian War Memorial. I am not really into war stuff, but we did go to Gallipoli last year and we visited some of the Vietnam War sites while we were in Vietnam. I thought an hour or two here for a quick look should be sufficient. How wrong I was! We were at the Australian War Memorial for close to five hours, and still didn’t get to see everything. We timed our arrival perfectly and waited only a few minutes before one of the 90 minute free tours commenced. The tours are run by volunteers who go through some of the main sections (predominantly WWI & WWII) explaining some of the exhibits and telling some stories. In general our guide was great. Unfortunately some factual errors were made when talking about Gallipoli (he got the location of Anzac Cove wrong), which diminished it a little for me. In the end the tour lasted almost two hours and I would still recommend going on one when you visit. There are some really heart-wrenching memorials. 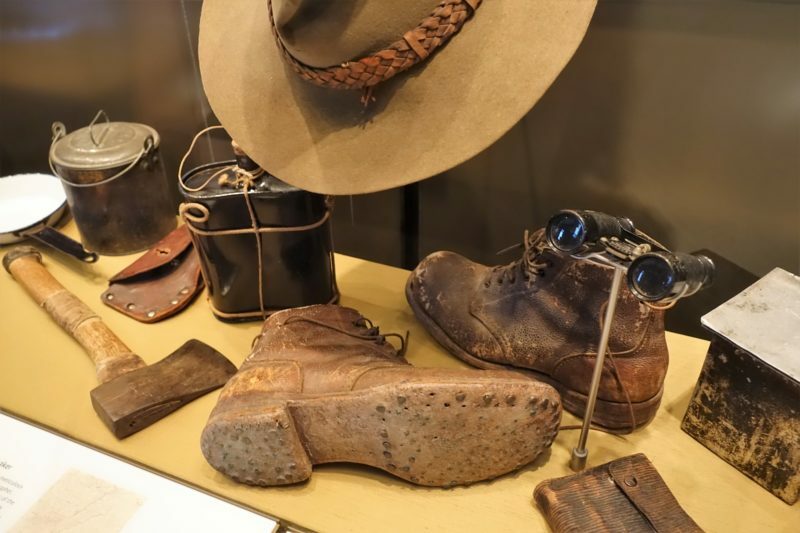 After a quick coffee break at the cafe we started walking through the museum again at our own pace, looking at the bits we didn’t get a chance to look at during the tour. 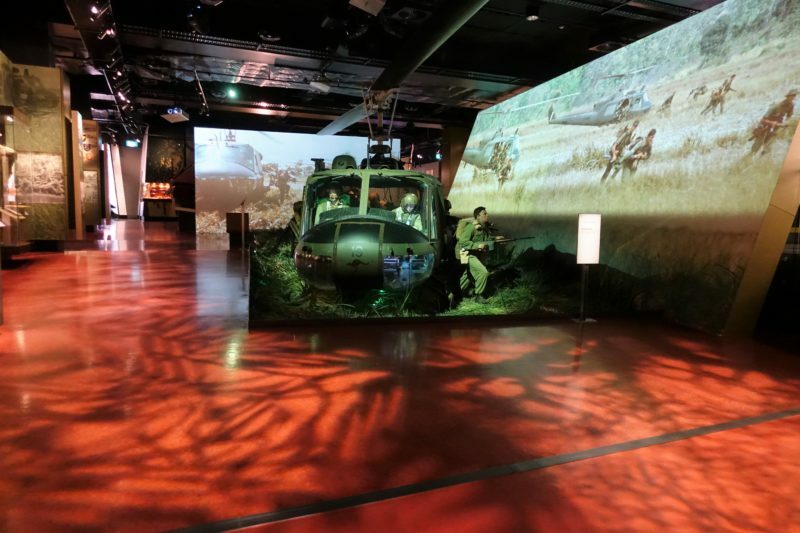 We also looked through the sections on other wars such as Korea, Vietnam, Iraq and Afghanistan. 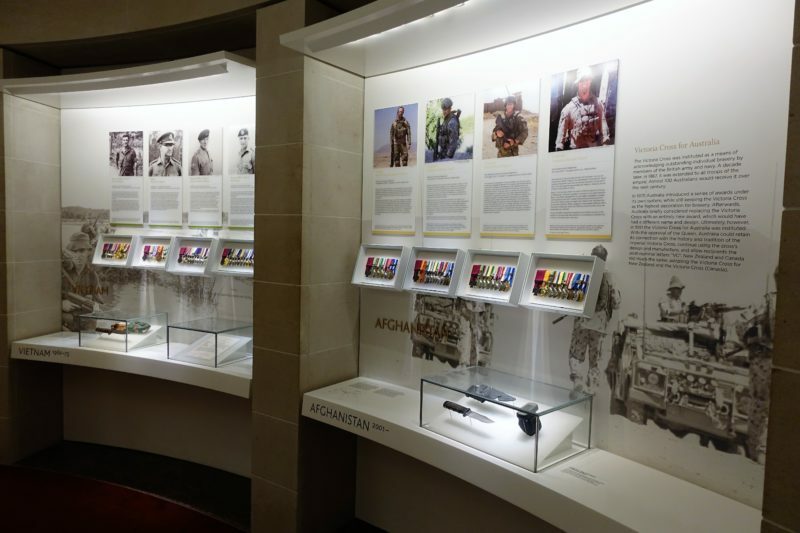 There is also a Hall of Valour commemorating the Australian recipients of the Victoria Cross, the highest award for bravery. The stories of the recipients showed the best of human nature. The dioramas are absolutely amazing! There is just so much detail. This one is showing the muddy winter conditions at the Somme. There is a huge aircraft hall showcasing some of the combat planes, but we only got to have a quick walk through this area. My favourite part though, was the Hall of Memory. This is where the body of the Unknown Australian Soldier lies, and is the location of the formal wreath laying on Anzac Day and at other times throughout the year. The hall is simply breathtaking! 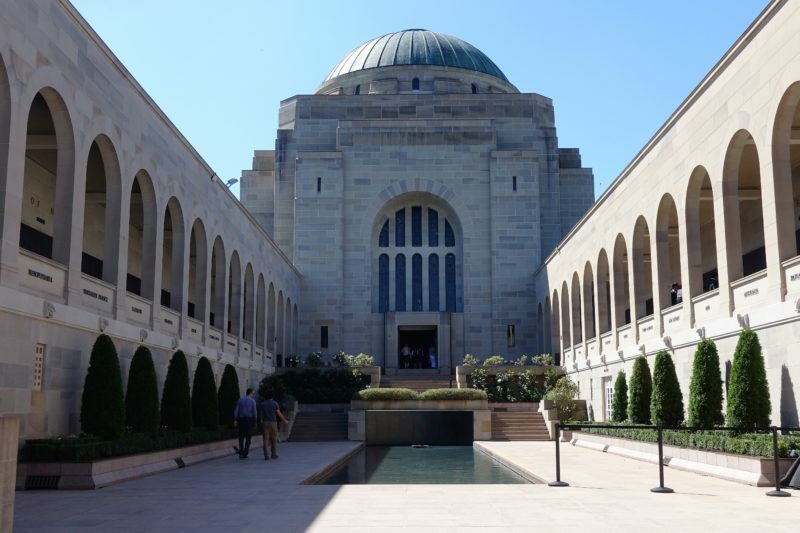 We had to leave before we were ready, but I can assure you we will be visiting the Australian War Memorial again when we are in Canberra next to see the rest. Entry is free, but they would love a small gold coin donation. 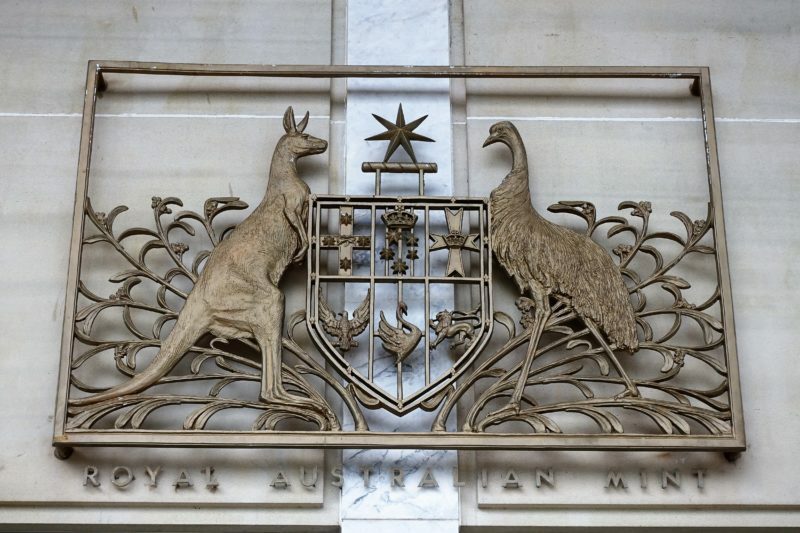 I had been to the Royal Australian Mint on a previous trip to Canberra, and we had not planned to go here. Driving past at about coffee time, we decided to drop in for a quick look and to refuel in their cafe. 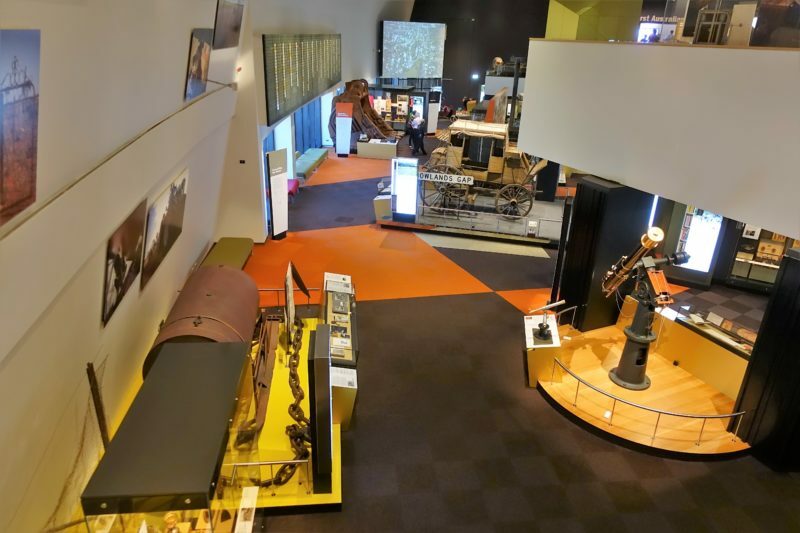 The mint has a small display area talking about the history of currency in Australia, and also examples of some of the custom memorabilia they have produced over the years – including the Olympic medals from both 1956 and 2000. There is also a raised viewing area to watch over the areas producing both proof coins and coins for circulation. Printing of banknotes takes place in Melbourne, so no huge press printing off money here! Next to the cafe is a gift shop with all sorts of things for sale, including a penny (or penny token) from the year of your birth, commemorative proof coins, or just a souvenir for your visit. I would suggest only half an hour to an hour is enough time for a visit here. Entry is free. 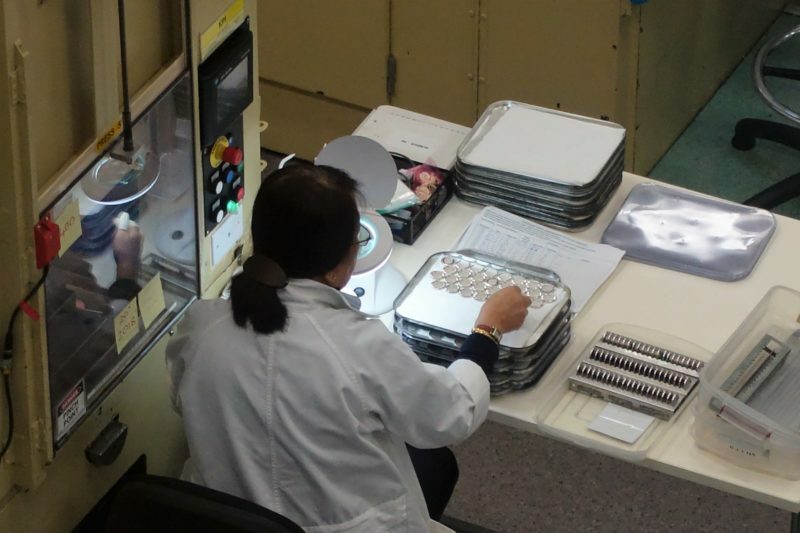 A worker checking proof coins for quality. 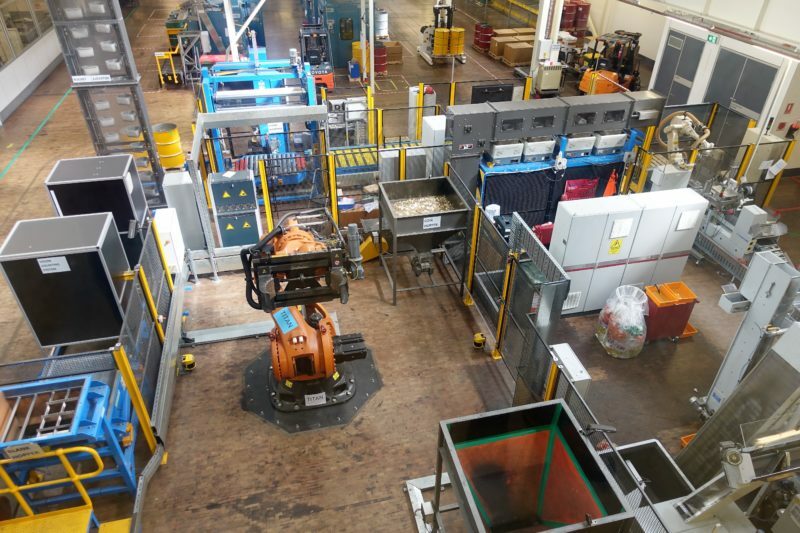 The production line for coins that go into general circulation. The National Arboretum Canberra is a bit of a drive out of the city centre and it looks like a plantation of many different trees. It is still in the infancy stages, so the trees are small, but in a few years this area will be a fantastic place to explore and picnic. The visitor centre has a great view over Canberra city centre, which we enjoyed while eating lunch in the cafe. We were a few days too early for the opening of some new areas, such as a maze and a butterfly garden. 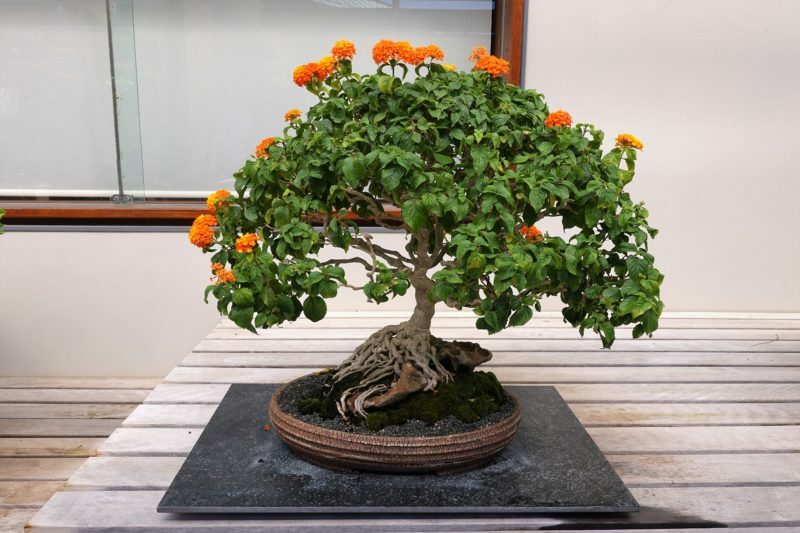 We did get to see a Bonsai display with some amazing small trees. I just don’t know how they get the leaves and flowers to also stay small so they are in proportion! There is a really cool playground for the kids, and I can see this becoming a popular family location on the weekends. For views over Canberra take a short drive to the top of Mount Ainslie. It’s right behind the Australian War Memorial and you can’t help but notice it. 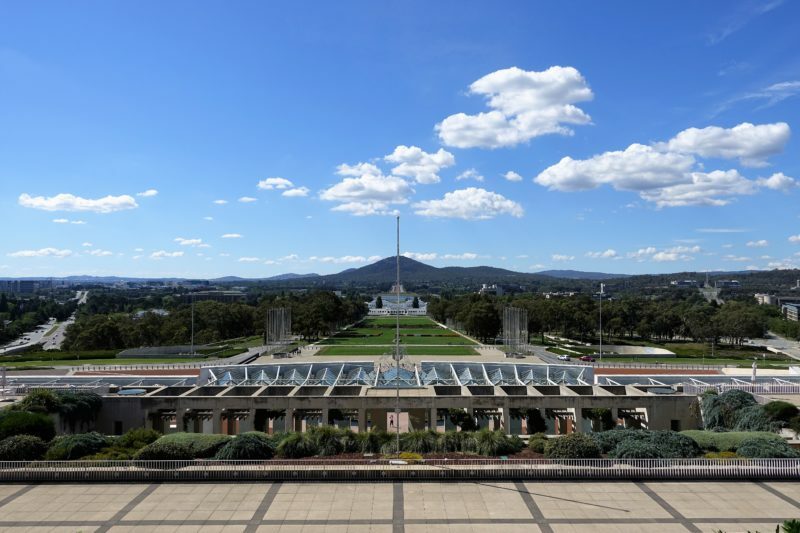 In the plans for Canberra about a hundred years ago the buildings were intentionally lined up between Mt Ainslie and Capital Hill (where Parliament House is). The climb to Mount Ainslie is also a popular activity if you would like to walk, with the path being busiest in the early morning hours. We didn’t get to these, but here are some other activities, some free, some not. Here are some of the places we ate that were budget friendly. Mostly we shopped at the supermarket for breakfast and snacks, and were lucky enough to have a friend invite us to dinner one night. Sure we could have eaten cheaper by heading to McDonalds, but if you are looking for proper meals, here are some options. Located at University House, we went to investigate Fellows Bar and Cafe shortly after our arrival on Friday evening looking for dinner. This is a university venue, so primarily aimed at students, so the fare is basic. More importantly, it is cheap. Simon got a Chicken Jungle Curry for $12AUD and I got Hokkien Noodles for $10AUD. The meals were not huge, but they were enough. It was clearly a popular choice with the students, as there were many people eating, and lots of others seated outside enjoying a Friday evening drink under the trees with live music playing. We would have considered eating here again but it is not open for dinner on the weekends. It was open for breakfast though and as part of our accommodation we received a 20% discount. I am a light eater at breakfast time. A piece of toast and a cup of tea is normally enough for me, but here there are two options. Continental breakfast was $14AUD, with a full hot breakfast for $20AUD. If you are a big breakfast eater, then this will be good value. Simon definitely got his value out of a hot breakfast. It’s buffet style! Diners can spend a couple of hours here grazing if really hungry as there is a good spread of food and drinks available. At the end of a long day of walking we ended up at the Kingston Foreshore for dinner. This is a new marina area with a lot of trendy, upmarket dining options. Not normally an environment conducive to budget dining! And yes, this is mostly the case, but we managed to find meals at Sammy’s Kitchen for under $20AUD each. 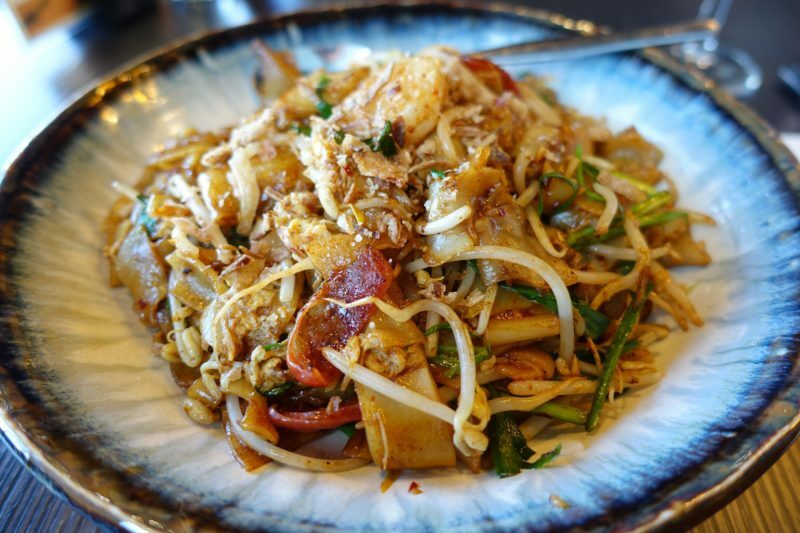 A Malaysian and Chinese restaurant, once Simon saw his favourite Penang Kway Teow on the menu our decision was made. 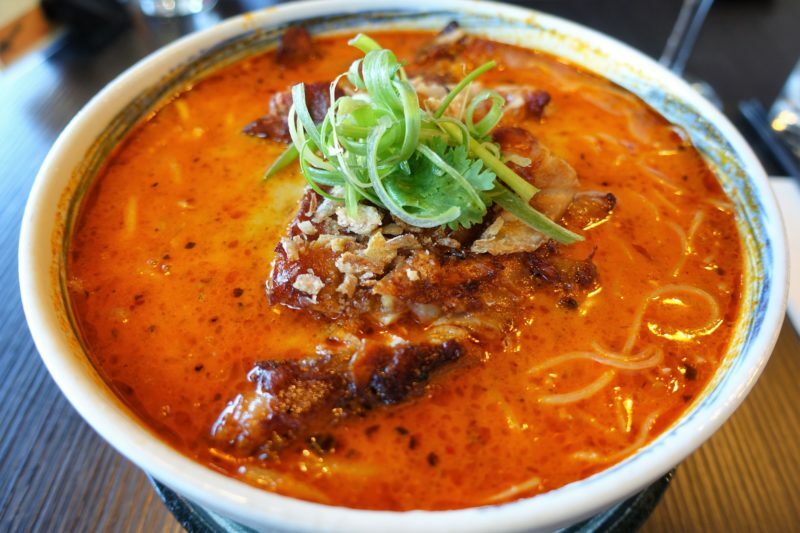 My choice was a Laksa. House wine was a very reasonable $5.50AUD per glass, and not totally undrinkable. If you are staying in the centre of Canberra, most of these places are within walking distance. We like to walk though, so perhaps check the distances before heading off. On our last day we had a friend drive us around for a few hours to see some of the places outside the city centre. Buses are common throughout the city, and the prices are reasonable on the Transport Canberra website. Head over there for more details. We got an Uber from the Airport, and it was $19AUD to Acton, taking about 10-15 minutes. 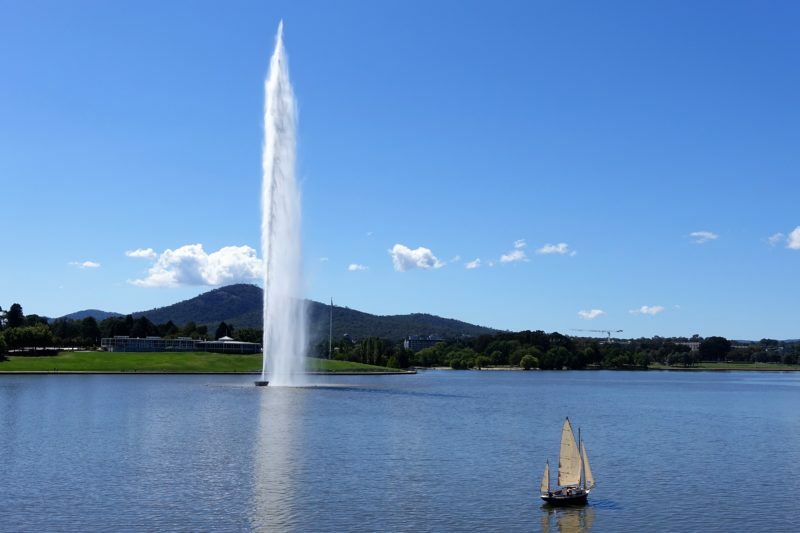 The fountain in Lake Burley Griffen is really huge. That is a real sail boat, not a model! I may have been less enthusiastic than Simon about our trip to Canberra but I have to say overall I was pleasantly surprised. Canberra is a pretty place with great outdoor spaces and walking tracks throughout the city centre. 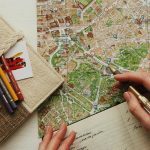 There really are so many things to do for the budget traveller. 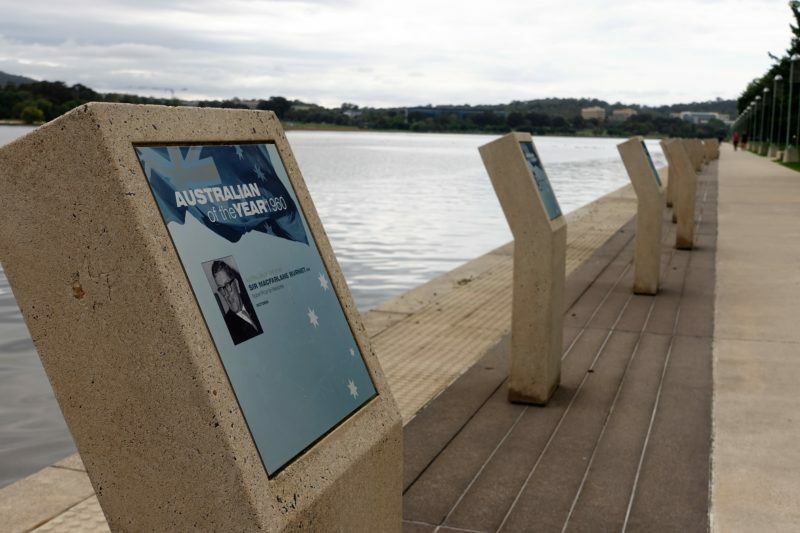 Just walking around there was a lot to see, particularly along the banks of Lake Burley Griffen. Perhaps, like us, you will happen to be in Canberra on a weekend when they are having a fishing competition. To help remove the carp, a pest, from the lake, competitions offering prizes are set up. It was a surprise to see many families out fishing. I asked someone and discovered there were prizes not only for adults but kids too. This time it was a boat for first prize for the adults. Last year two fish were tagged, and if you catch one of them, you win $10000. There were fishing lines for hire, so perhaps you could catch the tagged fish and pay for your next holiday or two! I’m quite impressed with your tiny camera’s ability capture great shots, including that panorama from the Arboretum. The War Memorial is an amazing place. Some superb artwork there, the Hall of Remembrance under that glorious dome is inspiring, and I never fail to get choked up over some of the displays. So much suffering and sacrifice. I love Canberra. Not a huge city, but it has some excellent cultural locations worthy of far bigger cities. The Portrait Gallery is well worth a half-day, but there’s only so much you can see, I guess. You did well for four days. Thanks for the quick tour in words and pictures. Thanks Pete. My opinion of Canberra has changed. It’s a great place to visit for a few days. Looks like I will have to go to the Portrait Gallery next time I am there! Wow great post on our National Capital. Think I too would have been mesmerized by the changing Artwork on those Poles. Looks so interesting. Thanks Carol. Canberra was a great place to spend a few days. Definitely consider it if you are thinking of a short interstate break. You managed to fit an awful lot in! I used to travel down to Canberra (it’s weird to think of anyone having to fly there, but then people obviously do!) when I lived in Newy every year to see a friend who went to University there and was also surprised by how much was on offer. It’s hard to compete with Sydney or Melbourne, but it puts up a fairly good fight. Really like it in the shoulder seasons too – especially in the spring when Floriade is on! 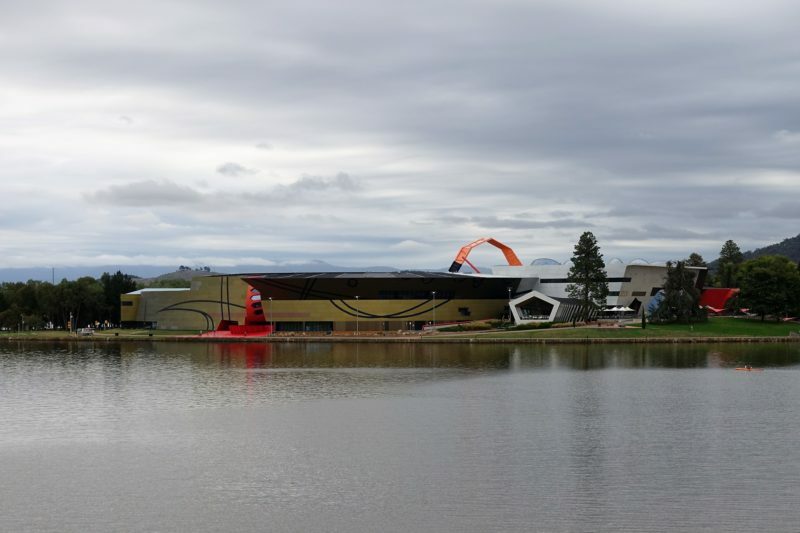 Hahaha, yes, some of us fly – it’s a bit of a drive from Adelaide 🙂 I want to go back during Floriade as I always hear a lot about it when it’s on and it has so many good reviews. I went to Canberra last weekend for the Versailles exhibition but do go there often because I have family there. 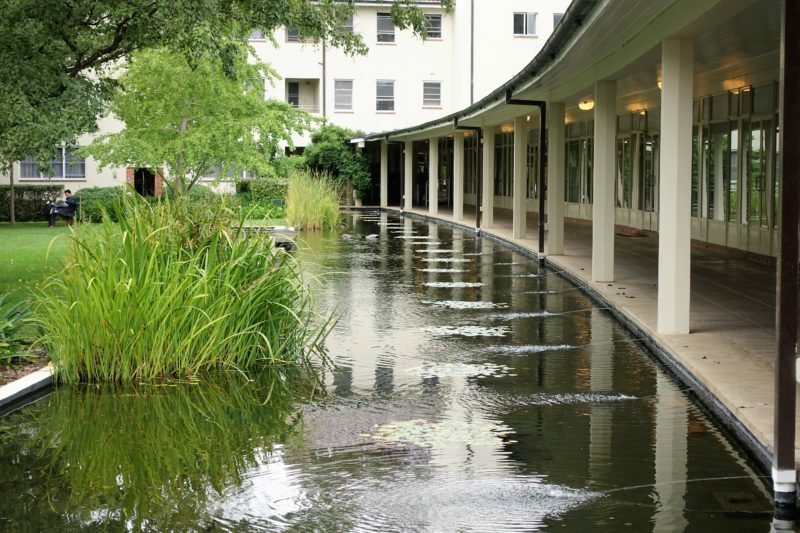 This time we stayed at Hotel Burbury which is an easy walk to NGA, High Court and Lake Burley Griffin to name a few places. 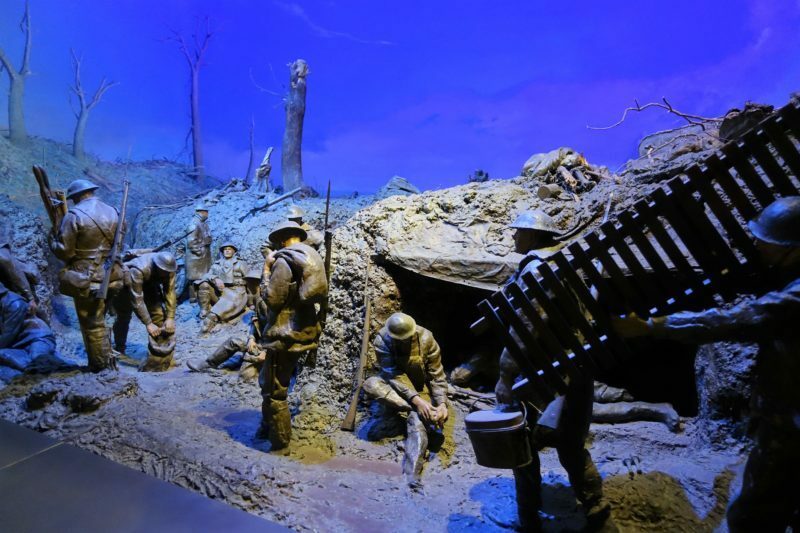 Like you, I visited the Australian War Memorial which is brilliant – great for reflection but the museum is fabulous and very engaging on so many levels. I actually thought that it beat the National Gallery of Art and National Museum Australia hands down. I’m not sure if it’s because they have stuck to their mission, vision and have plenty of funding and good leadership or what’s going on but for me I was very satisfied with that visit in particular. Thanks Lyndall. 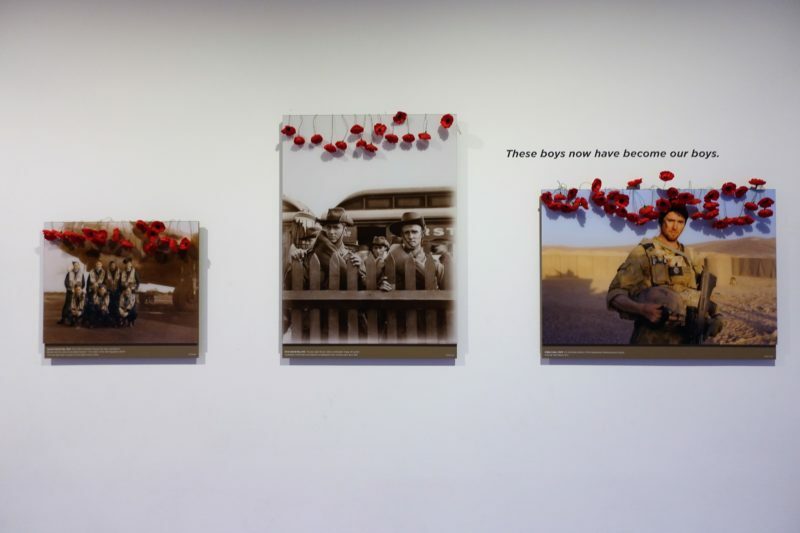 Yes, the Australian War Memorial is fantastic. Wow! This is such a detailed guide of Canberra. The National Gallery intrigues me! I haven’t been to Australia yet. Now I will but Canberra on my list, too!. Thanks Joanne. It’s definitely worth visiting for a couple of days. It’s not that far (in Australian terms anyway 🙂) from Sydney and easy to get to. Canberra seems to be a great place to visit. 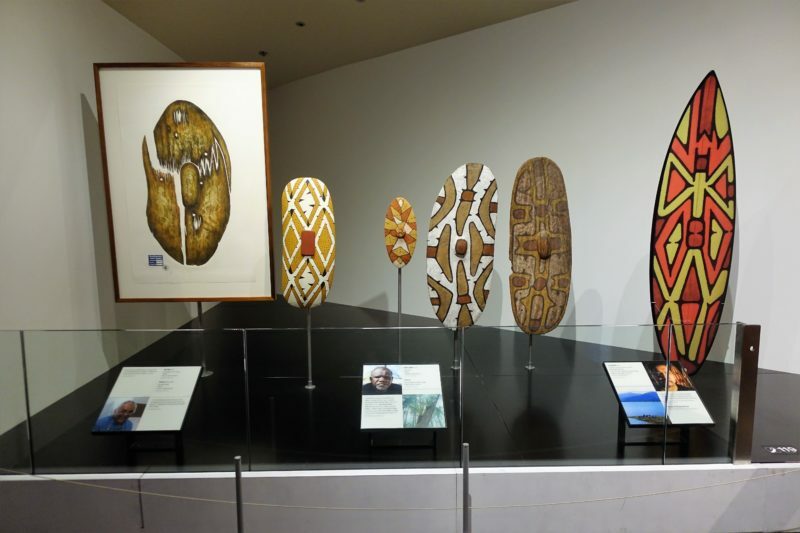 Didn’t know that there are so many activities to do while at Canberra. 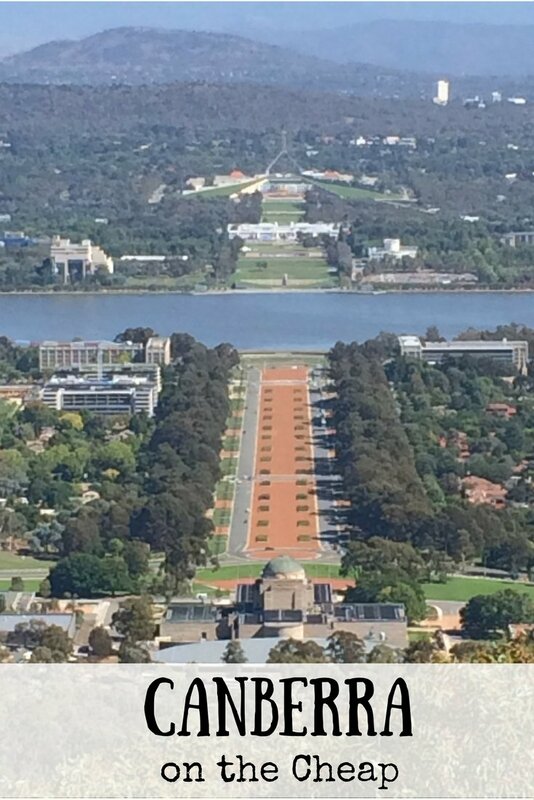 Loved the pic of the War Memorial from the Parliament house. A very nicely written article and a great guide. Thank you! 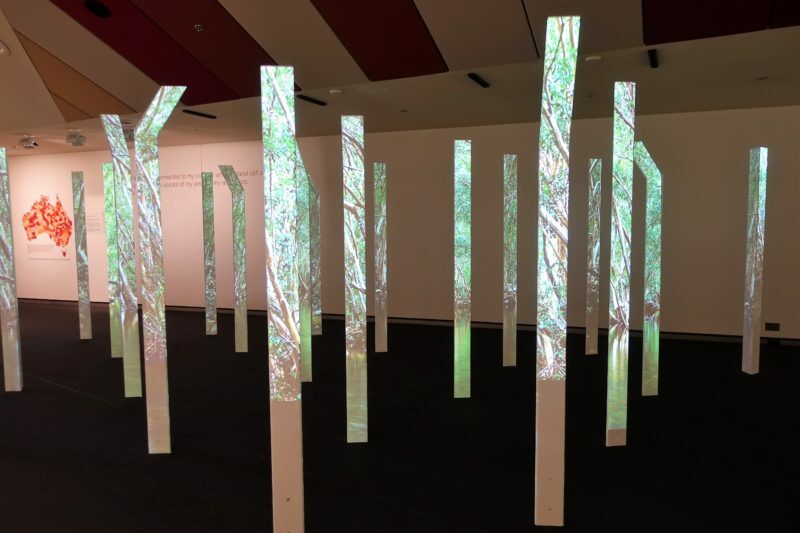 I was surprised how much there was to do in Canberra too! And there is probably more that I have missed too. Thank you 🙂 Yes, Australia is expensive – even for us as locals! I was happy to fond we could fill in four days for very little money. You don’t see much written about Canberra, so most of this information was new to me. I love museums, especially free ones! 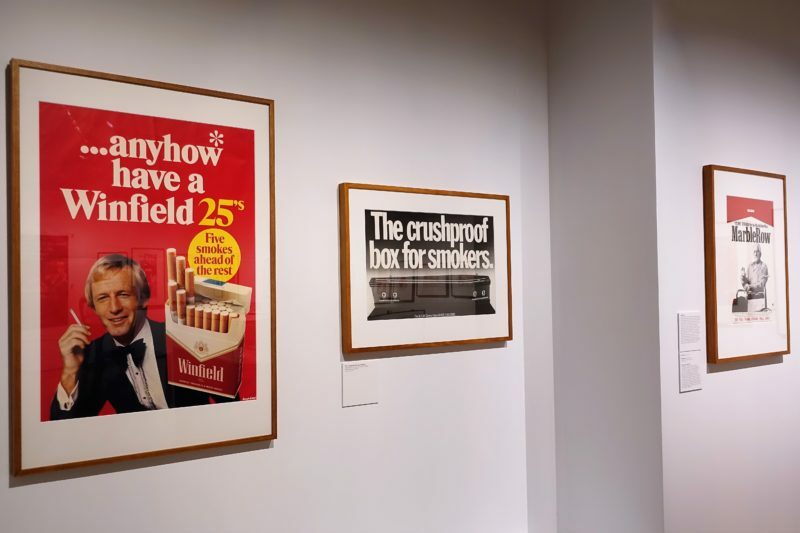 Canberra seems to have a good appreciation of history and the arts– my kind of place. Thanks Carmen. 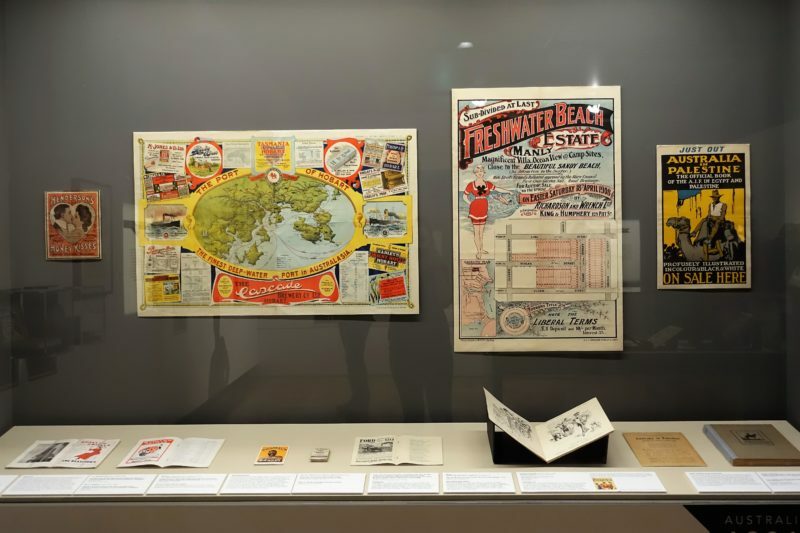 I think because Canberra was a planned city (it was only built in the 1920s) create to be Australia’s capital they planned to have the “National” version of every museum, art gallery, zoo etc – and they’ve done a pretty good job! The War Memorial seems very interesting. 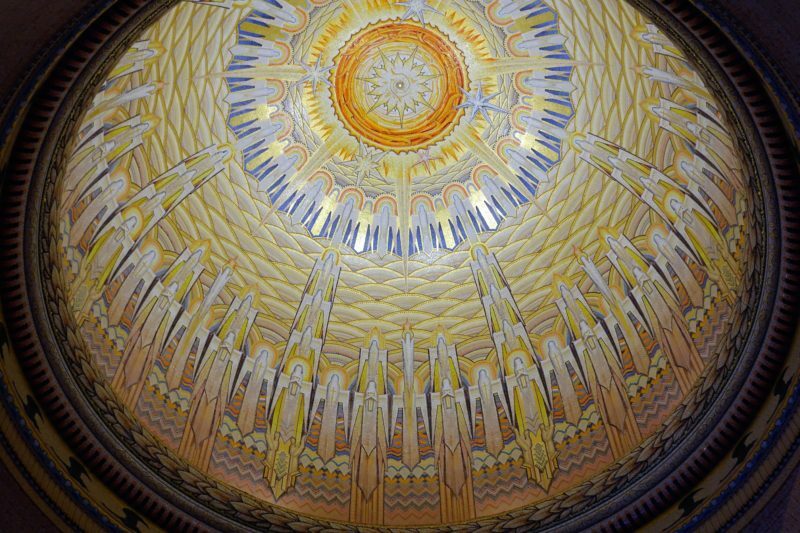 The Hall of Memory has such a fabulous ceiling…would love to see that. 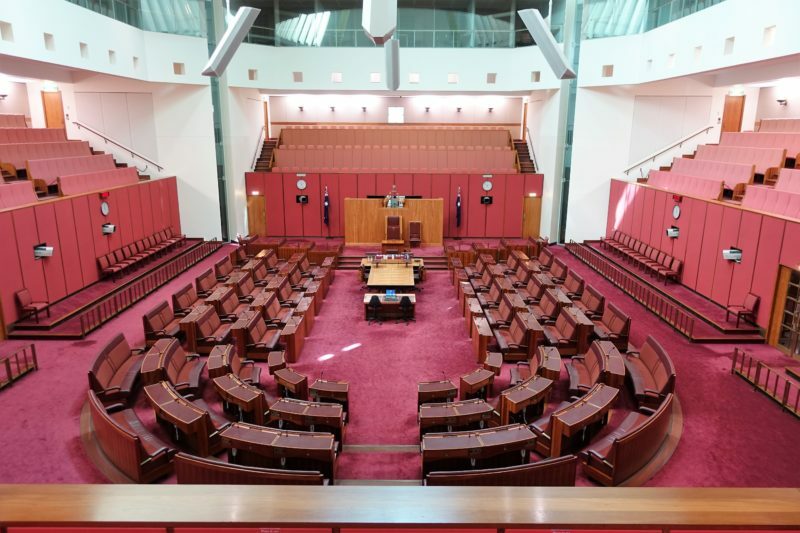 There’s so much to occupy one’s days in Canberra. Thank you! Definitely no chance of being bored in Canberra – at least if you like museums etc. 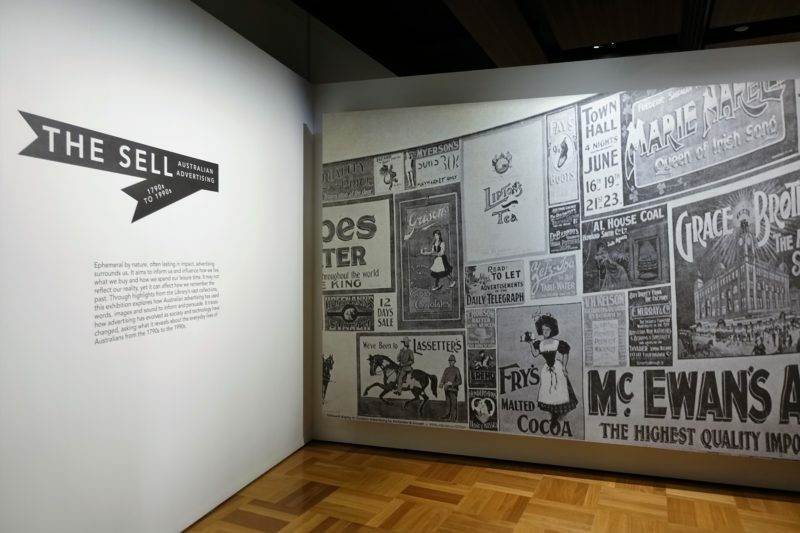 There is such a lot to do in Canberra, I am sure there never will be a dull moment.I loved, “The Sell”, the journey of advertising is depicted so fascinatingly. The War memorial is another solemn yet wonderful place that fascinates me. Canberra has been on my travel list for so long so I’m glad to read something well written about it. 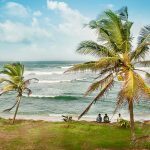 Will definitely keep this post in mind for when I’ll visit! Thanks Chiara. Hopefully you get a chance to visit there soon. As you say, this is not known as a tourism destination, so I have never heard of this place before. But you have crafted such a complete guide! It really makes me want to go. Amazing pictures as well. Yes, we are one of those strange countries where our capital city is not the most well known place! Thanks Mayuri. 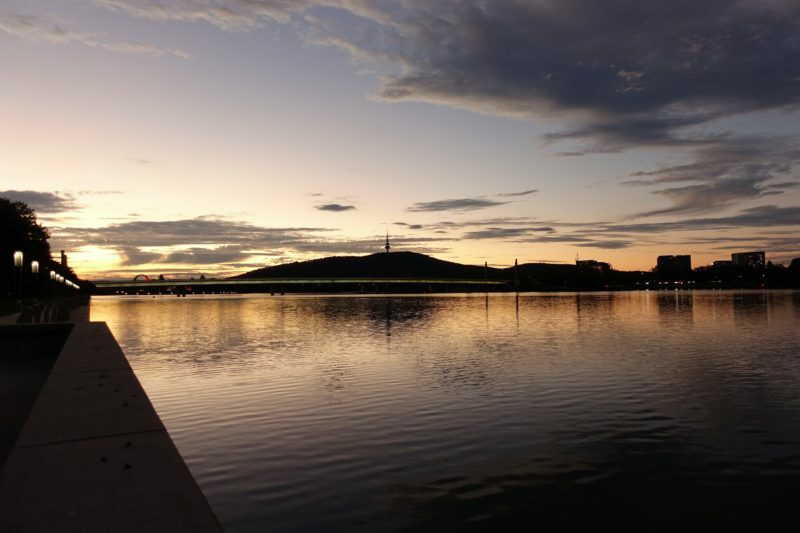 Many Australians haven’t been to Canberra, even though it’s our capital city. There really is more to do there than we think. This brings me back to my semester abroad in Australia! I didn’t make it to Canberra then but this reminds me a lot of Ottawa, our parliament city here in Canada. Thank you for sharing these budget-friendly tips!